DUP Museum Director Sharon Johnson and Pat Stevens, who manages the collections have been cataloging the entire collection. of Items at the Logan DUP. 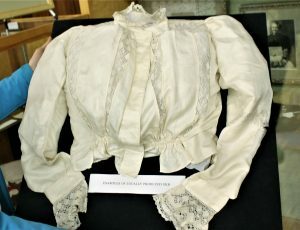 A pioneer era blouse made of silk in Logan. The silk industry was a thriving industry in Cache Valley in the late 1800’s. The silk industry was a thriving industry in Cache Valley in the late 1800’s. Paul and Susannah Cardon settled in Logan and imported mulberry seeds and silk worms from France. They experienced silk production as children in their homeland of Italy and the climate seemed similar. 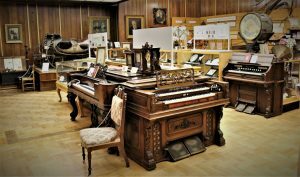 The DUP museum in Logan has two antique organs and a piano on display among the many items on display. Susannah reeled the first silk in Utah and won many medals for her work all over the country. Brigham Young had Savanna teach other ladies in Utah the trade. There were many pioneer women and girls who became experts. It took about 30,000 worms to produce 12 pounds of raw silk. The silk industry in Utah was short-lived; by 1906 it was decided it was less expensive to import silk from other places. 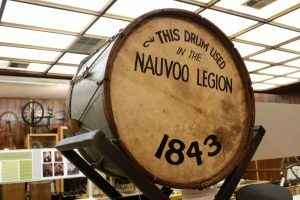 An early drum used in the Nauvoo Legion is one of the prominent displays at the DUP museum in Logan. Johnson explained the process of making silk from worms and how it impacted Cache Valley. A silk reel, a blouse made from silk, and a silk tie are among the items on display at the Logan International Society Daughters of Utah Pioneers (ISDUP) Museum located in the Cache Chamber of Commerce building at 160 N. Main St. in Logan. The pioneer organization has been housed with the Cache Chamber since 1966. Pat Stevens, who manages the collections, can tell a story about each of the many items on display in the museum. Both Johnson and Stevens have been at the museum over three years, and are determined to catalog all of the relics and learn what they can about each one. 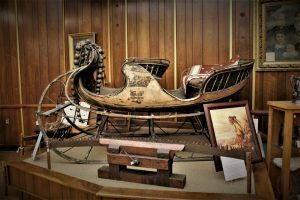 This cutter sleigh on display was owned by George W. Thatcher who was married Luna Young. Daughter of Brigham Young. The bells on the front of the sleigh were once owned by Joseph Smith. The sleigh made by the Studebaker Company in Salt Lake City. “We don’t have a lot of space, about 1,500 square feet, but we’ve tried to organize it so people can find things,” Stevens said. Among the hundreds of items on display is a cutter, or sleigh, owned by George Thatcher. It has sleigh bells that belonged to Joseph Smith. There is also a bedroom set built by Brigham Young. 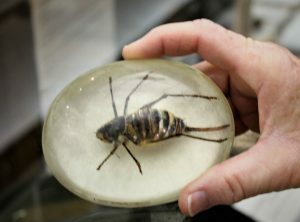 Pat Stevens the DUP Museum collections manager holds a preserved Mormon cricket. The large insect infested the crops of early Utah settlers and played a prominent role in the miracle of the gulls. Johnson said people donate things that have been passed down for generations and finally decide they don’t want them anymore, so they offer them to the DUP. As the 150th anniversary of the driving of the Golden Spike draws near, the DUP is looking for train memorabilia people would like to donate to the museum. Johnson said items at the museum can be enjoyed by more people. 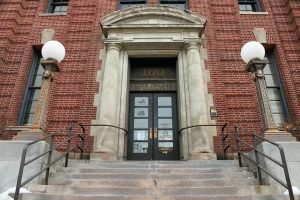 The Cache County Chamber of Commerce has listed their building located at 160 N. Main with a realtor and hopes to sell the building. The Daughters of Utah Pioneers hopes to stay in the building when it is sold. DUP volunteers share stories of early pioneers in Cache Valley by focusing on local history. The museum has artifacts, photos and histories of those who lived and settled Cache Valley. If the Chamber should sell the building, the DUP hopes to stay.